Wearable tech may be the next big thing, but when it comes to sports, it is far from the only opportunity for innovation. “VCs are starting to see that opportunities in sports technology are not just limited to fantasy and wearables,” said Anthony Caponiti, the co-founder of Hastag Sports at TechWeek NYC. Many stadiums have begun to experiment with proximity sensors and beacons, as the NFL did at the 2014 Superbowl. Due to privacy concerns, the beacons will act more as an approximation and will not give 1-to-1 marketing. “Sports fans tend to be early adopters of new technology,” said Manish Jha, president of Publisher Platforms. Analysts have found that placing beacons and sensors in stadiums have led to a 40 percent in-app usage because of integration with the team’s app. These apps aren’t just used to pushing merchandise, which they do and will, but can also make seat upgrades easier. As a vast majority of people allow for team apps to record their location, a team app would be able to notify fans when there are better seats available than the ones they are sitting in and would allow for them to upgrade and move much closer to the action. It isn’t just in the stadiums that sports apps can find usage. By using only your location and your favorite team, the NFL app is able to find where fans are hanging out and watching the game. So if you are a Giants fan in Chicago, the app can find you a bar where other Giants fans go to watch the game, according to Jha. Nor is it just the NFL that has been driving innovation when it comes to using technology to engage viewers. “MLS has been very good at embracing social media,” said Caponiti. So while wearable technology isn’t the only opportunity for innovation in sports, it does have a place. There are people talking about perhaps allowing fans to view a football game from the perspective of their favorite players, by placing small cameras on their helmets. 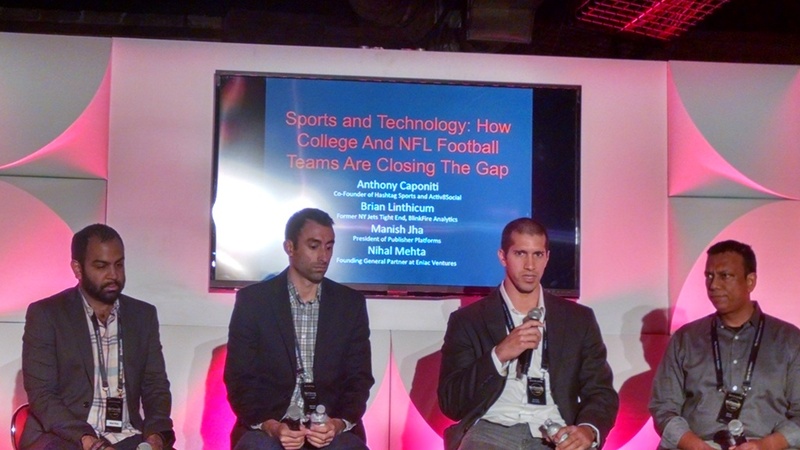 “Sports fans are going to adopt new technology, and we have to be at the cutting edge,” said Jha.